I disable all the buttons and set all the buttons to "None". Once it is done, I found that the speedup is tremendous. The only most useful button in my opinion will be the Button 3 - Camera which you can still enable it for convenient purpose while you're taking photo. Hope this tip helps. p/s: One of the things that I’m VERY NOT satisfy with PDA is the slowness in the software. Disable all the button seems really speedup for at least HTC Touch Cruise device and I hope it is applicable to your mobile device too. 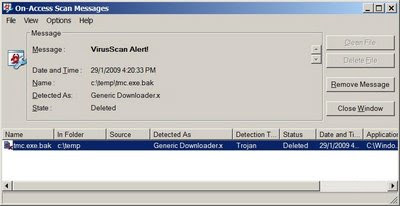 Is TMC.exe a Trojan Horse in MapKing? Apparently it is NOT a Trojan and it stands for Traffic Message Channel which is used to deliver traffic and travel information to drivers. However, if you do not use the traffic service or no such traffic services provider available, you can safely remove this TMC.exe. I personally do not use it, so I will just delete it. p/s: MapKing is the very popular GPS mobile software in Asia (i.e. Singapore, Malaysia, China). It is not a freeware. I have been testing Skype, Yahoo Messenger and Windows Live Messenger and it turns out that Windows Live Messeger is the best. At first, I thought Skype is the best among these 3 as it used to be an industry leader in VOIP technology but it doesn’t seem so. I tried Yahoo Messenger too and surprisingly it is not as smooth as I expected. At last, Windows Live Messenger is the smoothest in both voice and video. Perhaps you have different experiences? I recommended to use Windows Live Messenger for video or voice chat. In fact, I'm thinking if I should totally remove Yahoo Messenger since now we can link to Yahoo Messenger's friends from Windows Live Messenger. This probably saves up some of the resources. You can download Windows Live Messenger here. I received a feedback from a reader that video conference is in fact many to one and video call is 1-to-1. So technically speaking, this windows live message only supports video call but not video conference. P/S: My testing was performed on December 2008 and I have been using Windows Live Messenger for Video Conference call since then and do not encounter any major issues until now.